Places of interest and attractions. Some ideas on where to eat and drink & some local info. At the beginning of 2017, four neighbours in Canworthy Water decided to get together and help the failing bee population. 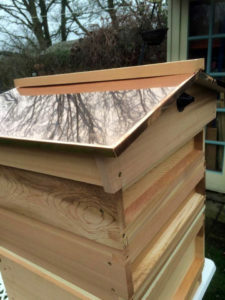 So, with Nick our only experienced beekeeper (one of the four and a former beekeeper before moving to Cornwall) and with invaluable guidance from the Launceston Beekeepers Group (LBG), we went about getting our hives and equipment. What had we let ourselves in for? Bees overwinter until April, so we had to wait until then to get our nucs (nucleus colonies). 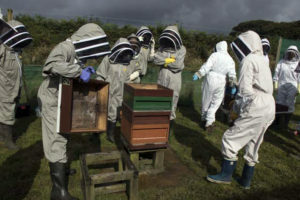 That came as a much easier task than we thought because we’d found a sympathetic Beekeeper by the name of Heather at Porteath Bee Centre, nr Rock, Cornwall. She was only to willing too help us with more much needed advice and to supply us with our first nucs. Three had over-wintered and the fourth was this years. 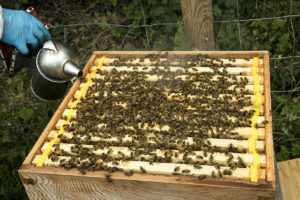 Being new to bees made it quite an experience transporting them back home in the brood boxes we’d taken earlier to her because all that was between us and the bees in the estate car was a foam strip blocking their access hole. Heather however had assured us that it’d be ok and sure enough it was. 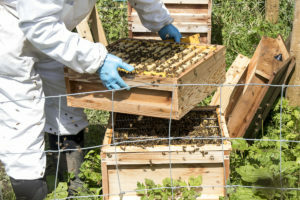 From the smaller nuclei developed healthy hives that meant we had to add as time passed two suppers (the sections that sit on top of the brood box and separates the egg laying queen) with new waxed frames in them to allow the bees to make stores of honey and pollen. This lead to our first honey extraction in our new electric extractor and I have to say here it was a very sticky affair and attracted wasps and bees even though the doors were closed most of the time. We ended up with approximately 15 litres. 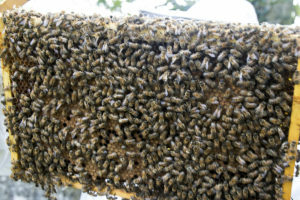 We now have another set from another hive ready for extraction and we’re gearing up for another sticky time of it. We have of course left plenty in the hives for the bees to winter on. It’s definitely been a new learning curve for all of us but a fascinating one at that. 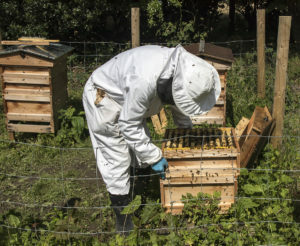 There’s more to it than you’d think and on top of that there doesn’t seem to be standard in Beekeeping, each area across the UK and in fact the world has different ways of doing things. 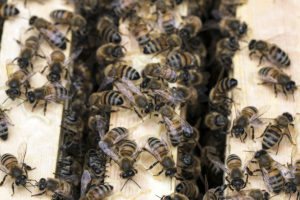 A FEW FACTS – a hive can support a colony of around 50-60,000 honey bees that comprises a queen, approx. 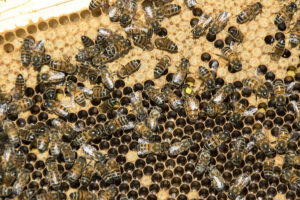 3000 drones (males) and worker/nurse bees. A new queen and drones mate in flight, the queen mating with several drones and then she returns to the hive and never leaves. See The BBA web site (link below) for more info. 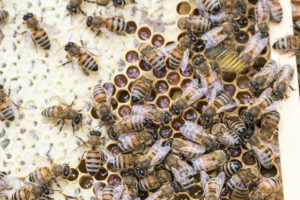 As winter approches and the hive begins to shrink in number (the queen stops laying) the worker bees evict the drones that are left to die as they are no longer needed. It doesn’t pay to be a male in the insect world does it! 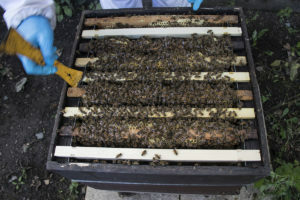 Clockwise: – 1/ New Hive. 2-7/ Nick performing a hive inspection while I took the photos. 8 &9/ Nick checking John’s hive. 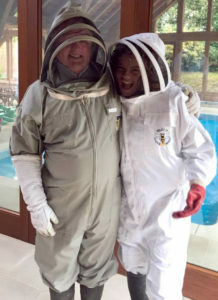 10/LBG Safari day and 11/Barrie & Jade (visiting friend) suited up ready for a visit the hives. 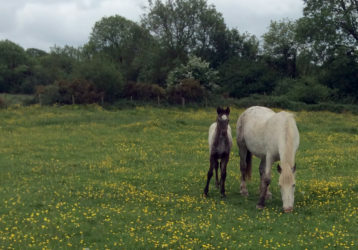 Example of one of our foals. If you wish to find out more about our holiday cottage or the horses that we have for sale or have some further questions then please call. The kids loved the pool and we all enjoyed the Brownies. Thank you! I am sure we will be back again. We really enjoyed our short stay, Lovely Hosts and fantastic cottage. Enjoyed the fresh bread on arrival, it did not last long!! Lovely Cottage, beautiful place. We have had a fantastic holiday.